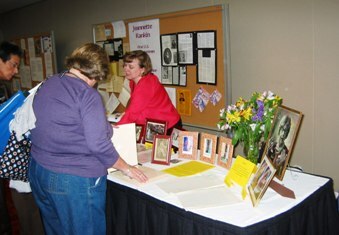 Jennifer Dawson (OCHS 1989 and Sixth Grade AP Social Studies Teacher at Lost Mountain Middle School at Kennesaw, Georgia) will exhibit a collection of Jeannette Rankin Memorabilia with emphasis on Oconee County connections. Oconee residents will have an opportunity on Sunday afternoon (March 7, 2010) at 3:00 to hear about a slice of national history with Oconee County connections. Jennifer Dawson (OCHS 1989 and Sixth Grade AP Social Studies Teacher at Lost Mountain Middle School at Kennesaw, Georgia) will exhibit a collection of Jeannette Rankin Memorabilia with emphasis on Oconee County connections at the Oconee County Library. The collection includes a picture (etc) formerly owned by Jeannette Rankin, her will, plat, pictures of Shady Grove and JFK’s article about Jeannette Rankin and much more. The exhibit was a popular item at a November 13, 2009, presentation at the Georgia World Congress Center at the National Conference of the Council of Social Studies Teachers. The Oconee and Georgia connections should be of interest to area residents. The presentation will be from 3:00 to 5:00 PM this Sunday and is free to the public. 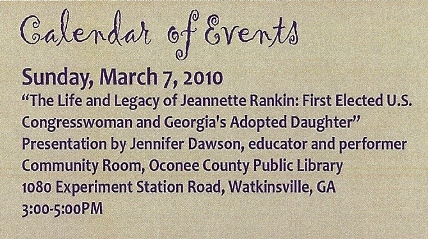 It is part of a month long celebration of the life and legacy of Jeannette Rankin (1880- 2010) at the Oconee and Athens-Clarke Libraries.